With the help of horses we can move on the paths which were not discovered or hidden once. Sitting on the horse you can direct the horse and at the same time relax and let you direct by the horse. Following the peaceful steps of the horse, who doesn't waste the energy and this way we can learn how to take time off and understand the life around us. 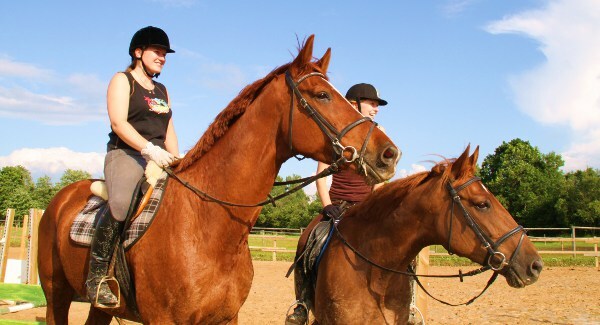 Juurimaa Stables offers wide range of horses and ponies – different size, colour and age- all together 15 horses. The price also includes the security service, we care about our customers' safety. All riders are welcome, it doesn't matter how old or young, newcommers or advanced. Advanced riders can order jumping trainings, which are acompanied by proffesional riding trainer Krista Raidmets. By dry and sunny weather the riding cources take place on the sandgrounds (30x70m) near by. In winter and by rainy weather it is possible to ride inside arena (18x65m). It is also possible to use cross country race tracks, which includes 30 hurdles. In Juurimaa Stables it is possible to take part in handycap riding. We have special equipment, coaches and horses. It is safe and comfortable. Also it's possible to take part of trainings with your own horse. The energy you get from horseback riding is increadible; the feeling that you are the one with the horse, gives you magical connection with the whole surrounding.